Jeep vehicles remain a mainstay of the American automotive industry, having earned their iconic reputation across the globe and in the heart of World War Two. Since its humble wartime inception, the Jeep brand has grown over subsequent generations - producing iconic, class-defining models for families seeking an ideal culmination of on-road composure, off-road capability, extensive cargo capacity and ergonomically crafted and convenient interior design. From the iconic Jeep Cherokee to the legendary Jeep Wrangler, Jeep's model lineup provides intrepid drivers seeking unrelenting mechanical fortitude and robust craftsmanship an array of options to select from. With numerous models and trim levels of Jeep models available from Don Jackson Chrysler Dodge Jeep Ram, drivers seeking their need daily commuter, family SUV or weekend adventure vehicle will find their desires satisfied within our extensive inventory. 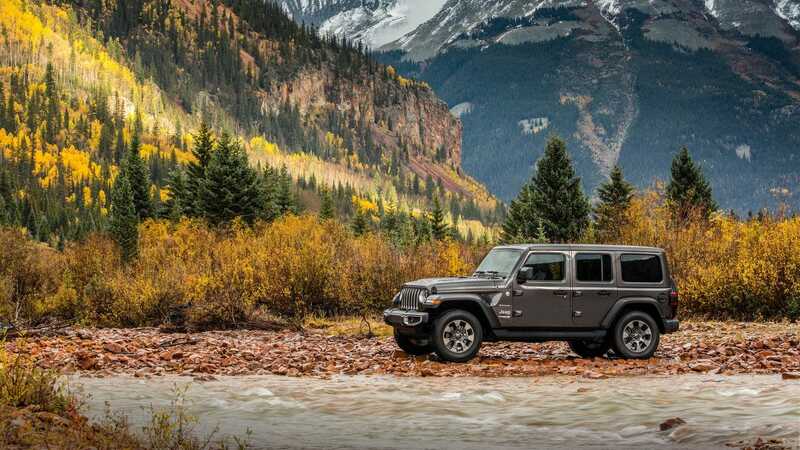 Having earned a reputation for off-road capability, rugged and robust craftsmanship and brawny exterior styling, the Jeep Wrangler definitively cemented the Jeep brand within the American automotive industry. Subsequent decades saw the development of numerous models to satisfy the growing desires of drivers across the nation. Vehicles such as the Jeep Cherokee (the first vehicle to use the term "Sport Utility Vehicle" in its 1974 brochure) and Jeep Grand Cherokee expanded Jeep's model lineup to suit the desires of families seeking steadfast mechanical fortitude, in addition to increased interior capacity for running errands or family adventuring. With the latest Jeep models providing unprecedented performance capabilities (such as the Jeep Grand Cherokee Trackhawk), and increasingly comfortable on-road performance (featured within the new Jeep Wrangler JL), drivers seeking a vehicle imbued with history and boasting the latest in mechanical engineering advancements will find their ideal vehicle within the Jeep lineup. The Jeep Wrangler stands atop the Jeep lineup, and global automotive industry, as a uniquely capable off-road vehicle. Boasting a heavy-duty four-wheel drive system, solid Dana® axles, and a rigid body-on-frame construction, the Jeep Wrangler, in its numerous iterations over decades of production, continually evolves to suit the needs of intrepid drivers. With the latest Jeep Wranglers fitted with advanced infotainment systems (the intuitive Uconnect® systems) and the latest in innovative engineering to provide unprecedented off-road capability and on-road comfort, drivers seeking ideal off-road capability and uncontested on-road dominance will have their desires surpassed by the Jeep Wrangler. The Jeep Cherokee, in 1974, revolutionized the automotive industry with the introduction of the term "Sport Utility Vehicle" - thus spawning one of the fastest-growing segments worldwide. Subsequent generations of the Jeep Cherokee have improved comfort and efficiency dramatically, culminating in the recent iterations' sleek exterior design and ergonomically crafted interior. Ideal for navigating narrow city streets or perilous back roads, the Jeep Cherokee combines on-road comfort, spacious interior convenience, and off-road capabilities effortlessly. The Jeep Grand Cherokee, Jeep's midsized SUV, comes available in an array of trim levels to suit a variety of budgets, driving styles and preferences. With model variants such as the 707-horsepower Trackhawk and the off-road-ready Trailhawk®, drivers receive the ability to commute to work, get groceries, and either outperform sports cars at a track or surprise off-road enthusiasts at a trail the same day, in the same vehicle! The Jeep Compass stands as a unique model within the Jeep lineup - nimble, compact and sophisticated, the Jeep Compass provides drivers with city-friendly dimensions and plush interior appointments, without compromising capability. Boasting best-in-class 4x4 highway fuel economy, the Jeep Compass performs a daily commute with the same confidence and poise it does an adventurous road trip into the mountains. Jeep vehicles remain an integral component of the domestic automotive industry. From their innovative, robust craftsmanship to their unique style and seamless incorporation of modern amenities, the Jeep brand continually offers drivers across the nation a model specifically suited to their budget and lifestyle. Stop by Don Jackson Chrysler Dodge Jeep Ram to explore our inventory of Jeep models, with the assistance of a sales professional. Committed to your utmost satisfaction, Don Jackson Chrysler Dodge Jeep Ram continually strives to surpass expectations throughout your next vehicle purchase. Stop by our dealership today, or give us a call to schedule a test drive of your preferred Jeep model!